I know, I know, it’s been awhile. NeeNee is nothing if not horribly inconsistent when working on this series, but I do promise it will be finished. Once this one is finished, I’ll go back to the other dramas screaming to be done as well. My goal is try to get the last episode done by the end of this year. Only 4 months to go! Okay. This is a daily drama. So, what is normally rushed with no basis takes forever. In regards to relationship building that’s fine, but in regards to plot development and dragging out certain secrets and everything…it gets tedious. It’s like a US soap opera where one day lasts for over a month (I kid you not, Days of Our Lives did this one summer when they were trying to build up teen viewership by rapidly aging their child cast into teenagers). Oh, what was I saying? Oh, that’s right. Now I am going to be doing several episodes together as, well, there isn’t too much progression to go into bunches of detail. Jun and his friend from New York talk about seeing Anna. This only confirms that Anna might really be in Korea and this royally sets Jun into a tizzy. After his friend leaves, he rushes out of the house to go to the station to see if Anna’s name was in a guest list for one of the shows, but it wasn’t because she was only there thanks to Donghae angrily telling Saewa to leave them alone (for the umpteenth time already—why can’t she just listen?). When he gets home, Hye Sook immediately complains about feeling uncomfortable that his friend from New York who knew the other woman showed up. Jun apologizes, but is still visibly rattle and Hye Sook is still worried about the other woman. Donghae and Bongi’s slowly progressing relationship is as sweet and cute as ever (Donghae is always calling her ugly, but we all know he doesn’t really think that). Sool Nyeo witnesses their close relationship and gets really mad at Bongi. She threatens both of them before leaving. The two go into the house and learn from Anna that the fermented beans have been dumped! Of course, Bongi and Donghae know it was Sool Nyeo who did it. There are a few left safe, but it won’t be enough for the test. Sae Young finds out her sister’s big secrets and is sworn to secrecy and forbidden to even tell her husband what is going on. Meanwhile, Hye Sook contacts the New York friend only to learn he’s already leaving. This doesn’t ease her mind, though. 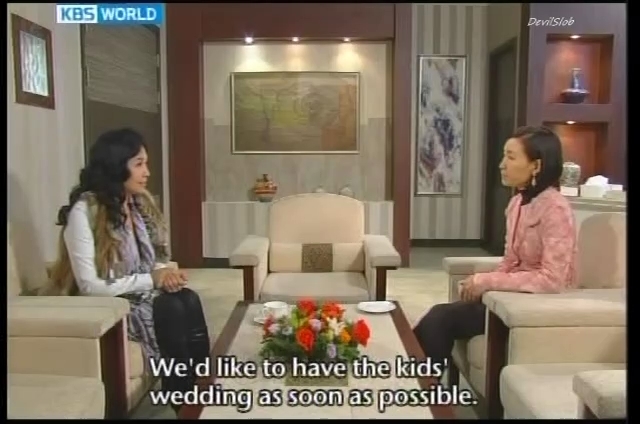 Sool Nyeo commits another blunder when setting the wedding date by agreeing to give gifts of the Kim family’s standing. Stupid. Donghae fails his test even though his food was good because there wasn’t enough of it. Cute Pil Jae and Anna moments abound. He touches her precious harmonica and gets bawled out, plus Anna demands he remove his underwear since he accidentally took Donghae’s. Oh, and Donghae’s got his radar up when it comes to Pil Jae approaching Anna—so cute and funny! Donghae picks up his mom and goes to the station to deliver Jun’s food and Sool Nyeo makes a scene causing Anna to lose her harmonica and Donghae to get angry. 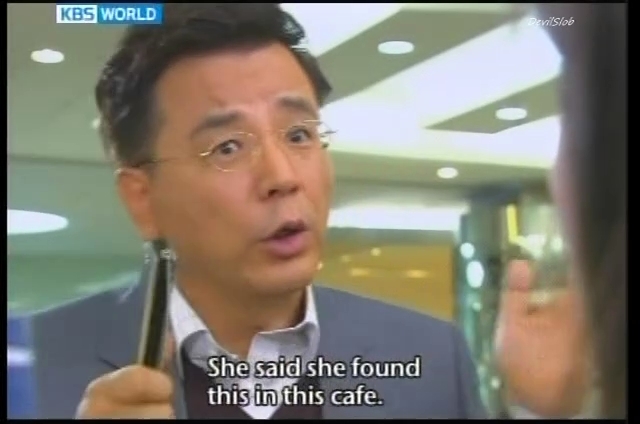 I did like how he told Sool Nyeo that her daughter is broadcaster so she can’t make a scene. LOL. Jun finds the harmonica and begins looking for Anna, but she’s already gone and Donghae just misses finding it with Jun as Bongi calls him and the staff at the station café had just changed. Oh, and Saewa has come up with a way to kick Donghae out. What is it? Jun now strives harder to find Anna while Saewa toys with Donghae as her plan is about to go into action. Donghae is told his final test will be preparing 30 Korean vegetables. Yowza! Pil Jae takes Anna to the market to see if she lost her harmonica there (she and Donghae got winter coats) while Sool Nyeo tries to get more money for the wedding gifts from Sun Ok who just managed to scrape together what little she could. 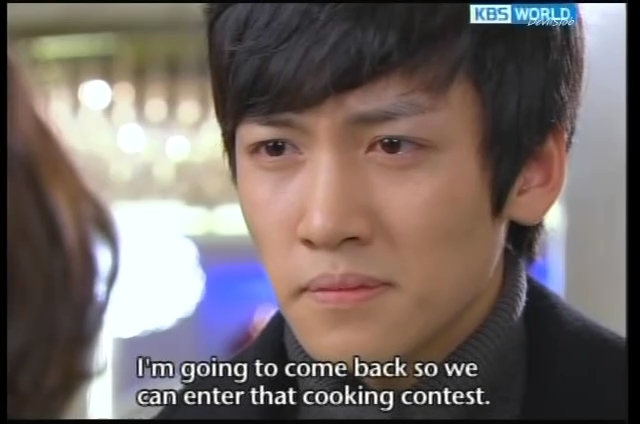 Kang Jae is striving to do his best to make sure that he gets the cabbage supplier deal with the hotel. I love watching Pil Jae do what he cant to impress Anna and her having really no clue about it. The fight with the witchy store owner was so cute as was Anna holding him back and putting a bandaid on his face. Donghae’s reaction when he found Pil Jae looking at Anna’s leg to see if she was hurt, too, was priceless! I liked how Pil Jae had a serious dicussion with Anna about leaving James in the past as her obsession with him will only bring pain to the son she loves. Pil Jae also says he has had to put his deceased wife behind him for the sake of his daughter as well. Meanwhile, Sun Ok worries over Donghae and Bongi getting closer and closer. She catches them feeding each other in the kitchen (they are practicing how to prepare Korean vegetables). The two immediately say there is nothing between them (it was so awkward because you know they really like each other). Sun Ok threatens to kick Donghae out if romance is in the air at all. LOL. 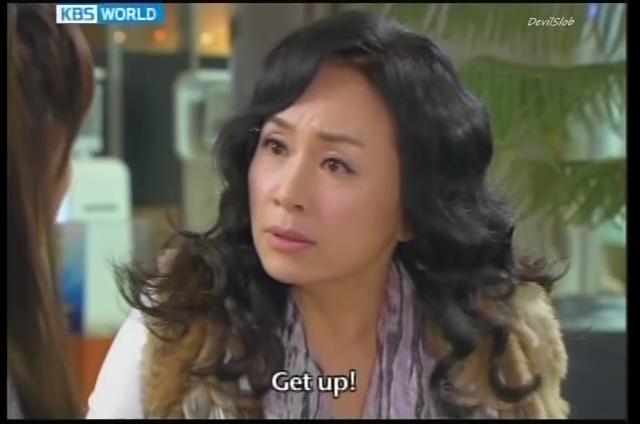 Hye Sook hands over the gift list to Saewa who is shocked and goes home to talk to her mother about her bravado. Tae Hoon hands over money and long underwear from his first tutoring pay check. I love that he is not getting defeated and doing what he can to prove that he isn’t worthless and provide for his children. With Do Jin’s arrival, Tae Hoon is once again the servant and is sent for tea. Sool Nyeo is shocked over the list as well and Do Jin offers to help. Saewa refuses, but Do Jin insists. LOL. He’s essentially buying his mother the wedding gifts instead of his wife. Gotta love it. Oh, and after Do Jin leaves, Sool Nyeo and girls go into her room for a powow and Tae Hoon overhears EVERYTHING! He’s not happy and I don’t blame him. He immediately scolds Sae Young for lying to him as they are supposed to be family and how can he face Do Jin knowing he’s Jun’s son? Jun’s oddness has Hye Sook on edge to the point she ties breaking into his locked desk drawer to see what he’s hiding. She even hires a locksmith and is caught by her husband. She apologizes for this and then says he needs to changes his actions if he wants her to trust him. Well…she does have a point, but at the same time, she had already vowed to trust him and she couldn’t even do it. Jun does open the drawer and show the harmonica (he had already hidden Anna’s picture earlier). His wife leaves and he puts in a call to go to a forum in New York. He vows to give up Anna completely if he can’t find her this time. The Lee house has been eating nothing but vegetables for a week to help Donghae prepare. He takes the test sans Hye Sook as she was too busy trying to get into her husband’s desk. Everyone passed him accept Do Jin, but majority rules so Donghae is officially hired. The only problem is Saewa’s plan has been put into effect. She called immigration to report Donghae. He was staying on a temporary visa after all. Immigration goes to the Lee house and it looks like there’s nothing that can be done. Donghae and his mom will have to leave Korea and settle things in the US (like getting proof of his mother’s original Korean citizenship). Once that’s done they can apply for residency and come back. Tae Hoon is scolded for acting up around Do Jin earlier and he says that given what family Do Jin is from, he can’t treat him nicely and bow to him (even though Tae Hoon is older, Since Saewa is the eldest daughter, Tae Hoon has to treat her husband as superior to himself). This agonizes Sae Young as she’s caught between her mother and husband. Bongi confronts Saewa about ruining Donghae’s life and Saewa wonders just why Bongi cares so much. Bongi basically admits that she’s fallen for Donghae and wont’ stand still. 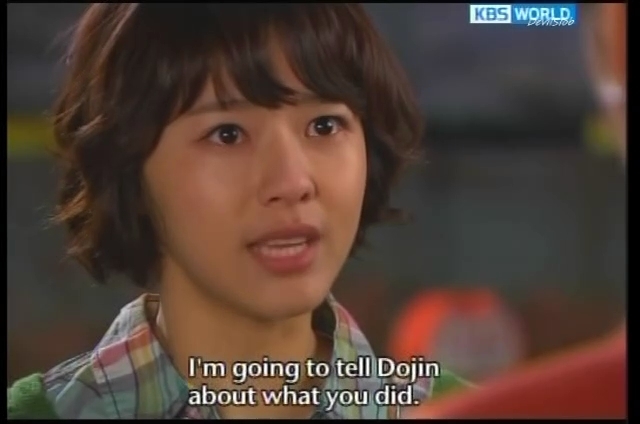 She then rushes off to the hotel to tell Do Jin the truth. Saewa follows her into an elevator and physically keeps Bongi from getting off to tell Do Jin. And this scene was so stupid. Saewa is always going on and on about her image, but here she is fighting in a hotel elevator where her future husband works. Do Jin learns of Saewa and the right and he rushes to the stopped elevator. The two girls come out and Saewa fakes a faint and Do Jin immediately lights into Bongi. If you look at the tapes, Saewa was the aggressor, not Bongi. Our leading lady does cow and doesn’t tell Do Jin what happened. Donghae arrives to see Bongi getting shoved hard by Do Jin and he won’t stand still. He is no longer their employee and he lets Do Jin have it. I do believe that Donghae is older so its kind of ironic to see the hyung scolding his dongsaeng. He wants to beat Do Jin, but won’t for Bongi and Hye Sook’s sakes, but he tells Do Jin to remember his position and act like he should. Wow. Just wow. This really annoys Do Jin and makes him hate Donghae even more. Donghae wonders what Bongi was doing and she tells him she came to seek Do Jin out to plead for him to help Donghae and keep the job for him until thinks get worked out. Fat chance of that happening now. Saewa gets back home and vows to destroy Bongi as well. Oh geez. This girl needs to learn when to leave well enough alone. Jun tells Hye Sook about going to a conference in New York. She isn’t pleased, but when Jun talks about struggling to come to this decision of whether he should go or not as he knows he feelings, this makes her a wee bit happy. So that’s why he was acting oddly. Well, she isn’t happy he’ll be in New York, but she encourages him to go as she cannot stop him from taking a business trip. The Lees have a sad farewell party for their boarders and Donghae promises to take care of things and come back soon. When he does, he will treat the Lees as if they were his own parents. Pil Jae gets drunk and carves his initials into the harmonica he bought as a replacement. His wish is that Anna not forget him when she’s gone. However, he sleeps in and misses the farewells. He rushes to the airport, but just misses Anna and Donghae. They are on the same flight as Jun, but that’s where the episode ends. And that’s the stopping point. I’ve actually watched the next two episodes, but figure they start the next section of episode recaps as we have a wee time jump (two months, but still). I really am hating Saewa and Do Jin. These two are just horrible. That’s why they are perfect for each other. I really do love how slow the relationship between Donghae and Bongi is moving as it feels more natural and you can see how they are developing really serious feelings with all they experience together. My blood is boiling! The elevator scene! What a nasty girl SaeWa is! Her mom is extremely inconsiderate and her little sister is childish and hopeless! I want to give up on them all!